Portable coffee maker is going to be a part of our daily life day by day. People drink coffee all over the world. But it is hard to get coffee as the mind wants. In coffee shops, many people come to drinks coffee. To get the best coffee you like most with your desired taste, and it is better to buy a coffee maker for personal use. And coffee crazy people must buy a portable coffee maker to take the real taste of coffee wherever he goes. To get the best coffee, you need to buy the best portable coffee maker. You can pick one of the best coffee makers in this article. Most of the coffee makers are for commercial use in the shop or café. If you want a cup of coffee while on a trip, what would be the easiest way? So, it is the easiest way to get a portable coffee maker. As there are so many machines available on the market, which one is the best? To feel the real taste of coffee at home, office, camping or wherever you go, you must have to choose the best portable coffee maker. To select the best portable coffee maker for you to use wherever you want. Here, we are writing about some best coffee maker machines for mobile use. The Cafflano Klassik- Portable Coffee Maker is the world’s first all in one pour over original coffee maker. It contains fully ceramic burr grinder, pours kettle. It also has an insulated tumbler, etched stainless filter dripper, and lid. It has a beautiful vertical stack design. For this reason, Klassic is easily portable. It is not so bigger than average 22oz tumbler and weighs only 1lb. The measurement of this coffee maker is height 7.6 inches and Width is 3.5 inches. This design is very compact, and it fits into any pack easily. On the way to anywhere, at your office or home or camping or any other place, you’ll enjoy the real pour over coffee. 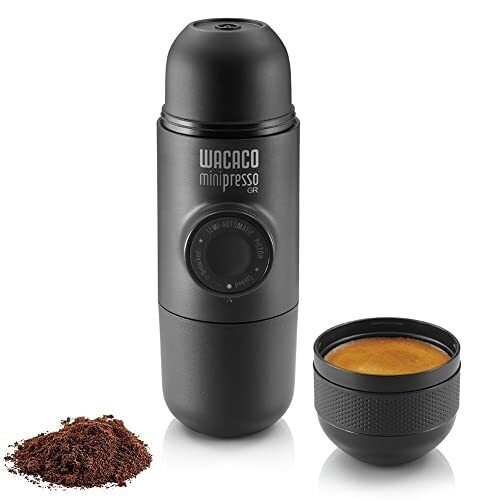 If you have coffee beans with you, you can enjoy a great coffee anytime, anywhere because of its compact design. According to the markers of the grinder, always use premeasured coffee beans to make a perfect cup of coffee. Generally 16oz fresh coffee is made from 10-15gm coffee seeds. This machine is designed for serious coffee drinker people. This design has been awarded in several places. It was voted as the most innovative product in New York Coffee Festival. As well as Cookshop & Housewares Association awarded it. This product also won gold from Outdoor Industry in Friedrichshafen. 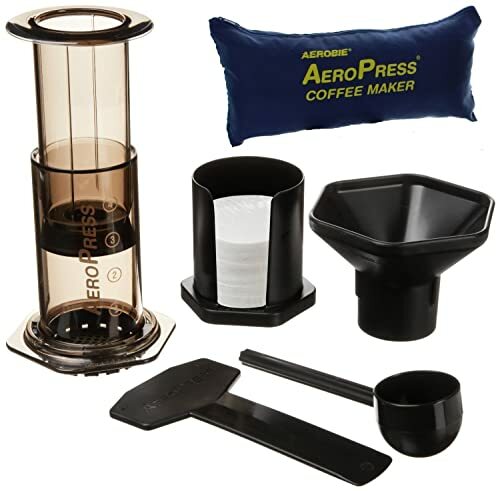 The AeroPress Coffee maker is another perfect coffee maker machine. This portable coffee maker is also recommended because of its unique specifications. To produce excellent flavored coffee, this is a unique espresso coffee maker. IT uses perfect gentle pressure and total immersion to produce a nice cup of coffee. This United States made coffee machine can make both American style coffee and espresso-style shot using cappuccinos or lattes. This machine is microfiltered. So, you can produce pure and particle-free coffee using it and can store this for days to enjoy cold brew coffee. You can carry this anywhere, anytime while traveling or at work or home. This product includes a travel bag, and this feature made this product great. This coffee maker is more stylish and very suitable to use. It has some super features. This machine has an innovative design. To make a tasty, rich and bold espresso, it also has a powerful extraction pressure. This coffee maker is small, light and versatile handheld espresso coffee maker. You can easily grind your coffee beans using it. This gives you the control of your coffee preparation. As a result, you’ll get quality and sophisticated espresso shot that will please you. This machine gives you the opportunity to vary your taste. You can easily use any variety of beans/roast to try different flavors. This coffee maker contains semi-automatic pistons that allow controlling the amount of extracted coffee. This coffee maker is efficient and easy to use. This machine is functioned nicely to produce perfect coffee. To use this machine, you don’t require using compressed air or N20 Cartridges. This machine can be used without electricity because of this hand operating system. This is another perfect portable coffee maker out there. It has some super features which made it uncommon. It is essential to that kind of people who want to take the real taste off coffee while traveling. Espro travel Coffee Press is for them. Because this is designed for the people, who want to enjoy the real taste of coffee while traveling. It has patented double microfilter. For this reason, you can enjoy the full taste without grit in your mug. It has double layered stainless still wall inside. So you can enjoy hot coffee for a long time using this. Extraction stops instantly after pressing the button in this machine, and this gives you the fulfilling taste of coffee in every sip. You can make 10oz coffee in this machine and carry 15oz. This is guaranteed for the lifetime. This is like your lifetime friend. The Nanopresso Portable is another very nice coffee maker, bundled with a protective case. 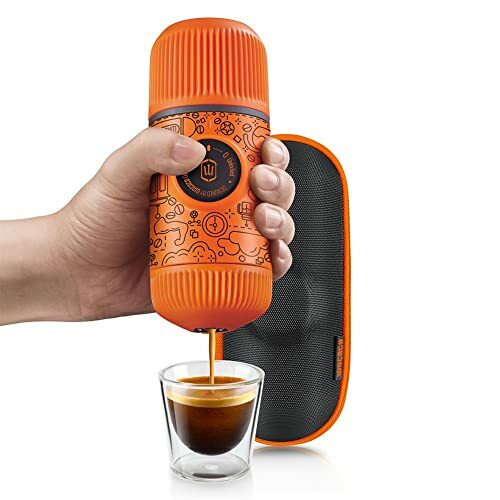 The Orange Tattoo Patrol Edition is an 18 Extra Small Travel Coffee Maker, and this is a Manually Operated Perfect for Kitchen and Office. The Nanopresso Orange Tattoo is a limited edition product named. It’s a onetime production and designed specially by the in-house designer. This has a nice body which is covered using coffee doodles art. This design is very uncommon, and the product is very limited. Using this machine, you can make maximum 18bars stable pressure while making coffee using your hand. It has a newly patented pumping system. It can deliver more than other espresso machines. Best finely ground coffee is needed for The Nanopresso because it works its best with this. This is very easier to operate and use. The Nanopresso uses its power, not the power of your hand and it requires 15% less pressure from other models. It is designed for your traveling companion choice. This is extremely light and small to carry. For this design, you can easily carry it wherever you go. Its measurement is: 6.14 inches and weight is 336 grams. 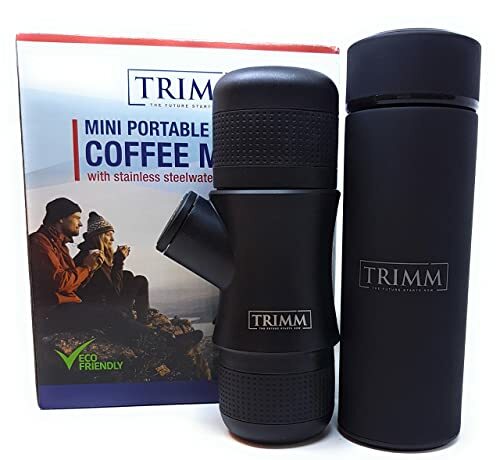 Weight is at just 0.74 pounds/336 g.
Another super portable coffee maker which has a vacuum insulated travel mug, premium stainless steel, hot and cold brew (12 oz) and other features which made this awesome. Like Aerobie Aeropress, The versatile KOHIPRESS has full immersion steep and a plunger press which is pressurized. It helps to make a cup of smooth, rich and tasty coffee. This is a fantastic feature of KOHIPRESS which reduce your cost. 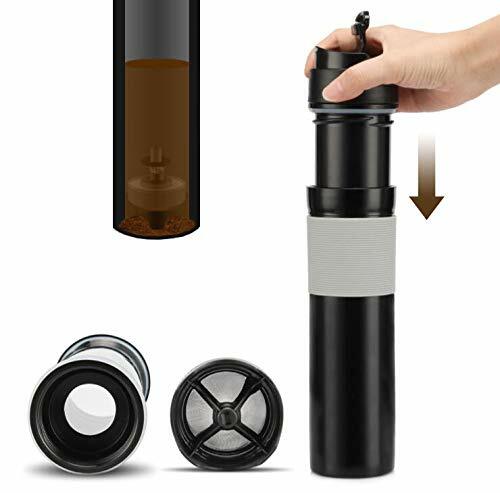 You can reuse its filter more than one or more times because it is made of micron stainless steel mesh, which is environmentally friendly too. It is very comfortable to carry this machine where you go. There is no fear of leakage while carrying this when you are on travel, camping, office or home. It can carry 12 oz. coffee while its tare is only 13oz. Its self-lock mechanism helps you to clean up the brewed coffee from the ground. After finishing, rinse the chamber and Our Patented self – lock mechanism separates the brewed coffee from the used coffee grounds. Once finished, keep the chamber and plunger under the tap to wash it. This is made using high-quality materials which are FDA approved. Premium grade stainless still used to make its chamber, and its Vacuum system (Double Wall) keeps hot water hot and cold water cold. 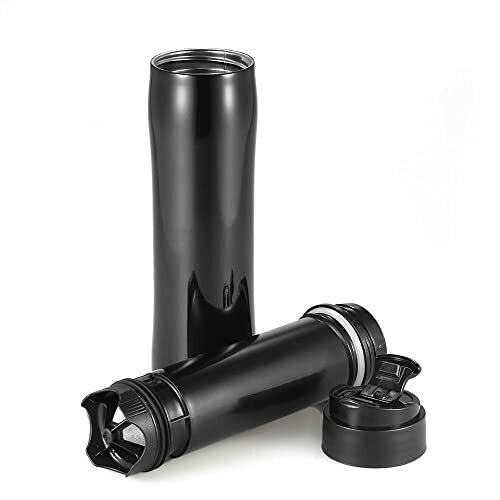 It has used 100% safe for food, food grade plastics to make the plunger BPA free. 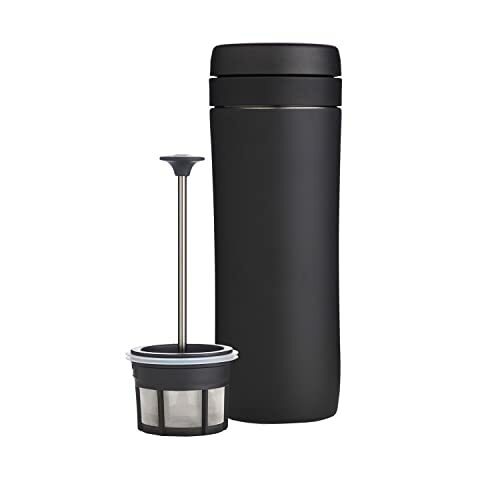 Best portable Espresso Maker and flask single cup coffee maker and tea Thermos Bottle. Perfect travel set excellent gift idea. Are you a traveler? Do you love coffee and camping trip, or hiking or even in a figurative hotel? If yes, then this is for you. You can choose this machine because of its excellent design, and it is straightforward to assemble and carry. It has a thermos also which keeps your coffee warm for a long time. It has a black cinch bag where you can easily carry your vacuum flask, coffee parts and beans, and other coffee maker combos. This machine is functional overall. This mini espresso machine runs without any cords, electricity or batteries. This is perfect to use even in disasters like hurricanes, blizzards, etc. when you are badly in need of caffeine. Cleaning of this machine is much easier. Just apart from the parts of the machine and wash it using water. But not only coffee, but you can also keep tea or other hot drink in it. It has removable thermos strainer, simply add your leaf tea on its top. You can make a single cup of coffee without spending huge money on it. It’s very cheap to make a cup of coffee using this. Compact design offers you take it anywhere – work, home, school, travel or camping. The system of using this machine is straightforward and simple. Just heat the water, fill the reservoir with it and heat it. It has a compact design to carry this anywhere its user goes. You can use this at home, office, camping or hiking. 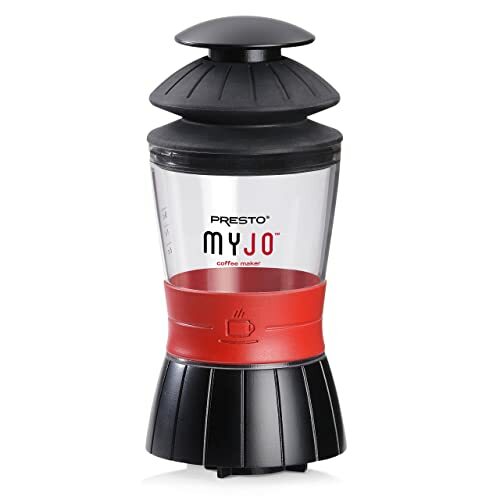 This Presto 02835 is very easy to make a cup of coffee using this machine. Just assemble the machine, place cups in the base, before brew attaches the pimp and the water reservoir. After brewing, enjoy a super sip of coffee! It has assembled place on the top of coffee maker where you can use your favorite coffee mug or cup and pump water to brew through K-Cup pack. This is another stylish and super portable coffee maker machine. The French press has super design. It is combined with mug which lets you drink coffee in any place wherever you go. You can easily control it to get a freshly brewed coffee. This product contains genuine quality. To keep the purity of your drink, it is made using food grade plastic which is FDA Approved and BPA free. It has a heat-resistant silicone rubber inside it. Very simple to use and it saves your money. It is designed finely to carry this out wherever you go. You can carry this at any place like home, office, camping or hiking. The spill-resistant lid is designed for the coffee crack people who loves to travel and wants coffee as must there. It has a 350ml lightweight mug with it. You can use this while you are on your journey. In this coffee maker, you can produce tea or other drinks too. Whenever you’ll drink, you’ll get a fresh taste of your drink. To make a perfect cup of coffee, add water and coffee drink, press to brew and drink your desired coffee. It is straightforward to clean this machine, Remove the plunger easily and clean it. Coffee crazy people will love this because it has a modern design with a simple operating system. This is perfect to bring while hiking or wherever. High-quality espresso can be made using this. This machine works using three steps. The portable design of the Litchi MANUAL ESPRESSO MACHINE is fast and straightforward to use in three phases. At first, add ground coffee in the non-paper filter using the incorporated measuring scooper. Secondly, add hot water into the chamber and at the last step, push the pressure pump. You have to do this using your hand. This will provide an excellent espresso for you. You can mix milk into it. 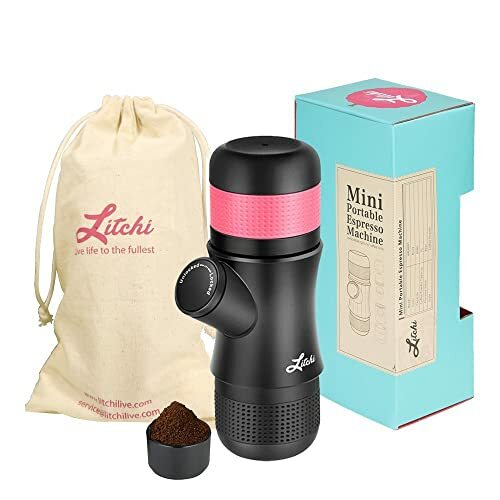 There has additional filter basket and carrying bag with every Litchi portable coffee maker. These great gifts are for the crazy coffee lovers who want coffee wherever they go. Food grade plastic used to make this machine which is BPA free and FDA approved. LFGB certifies this. This product has a warranty for 1Year. For this reason, your purchase is safe! Litchi provides the highest quality of the product to the customers. If you want to make a cup of coffee for yourself, choose a portable coffee maker. Hope you have already decided which one is the best portable coffee maker for you. We have researched and tried to come up with more information to help you to make the decision. All of the coffee makers mentioned above are from renowned manufacturers and highly recommended by their users. We hope you will also enjoy your coffee wherever you want!